Fat Helga inspects her personal bodyguard of elite hearthguard shieldmaidens. Roland, comte de Frontenac, her sworn enemy vowed that he would destroy the pagan settlement of Jomsborg. But Helga is not about to let that happen. She’s pleased to see that all her battle sisters are thirsty for battle. Many French knights will die today. That thought made her smile. “Move forward knights of Christ!”. Rain pours down from the skies. The plains around Jomsborg are transformed into swamps. “Destroy all pagans and deliverance will be yours!”. Warrior priest Otto von Jungingen’s loud voice is heard all along the French battle line. “Follow the light of the lord, follow the holy cross and you will not falter!”. Otto readies himself for the imminent clash. 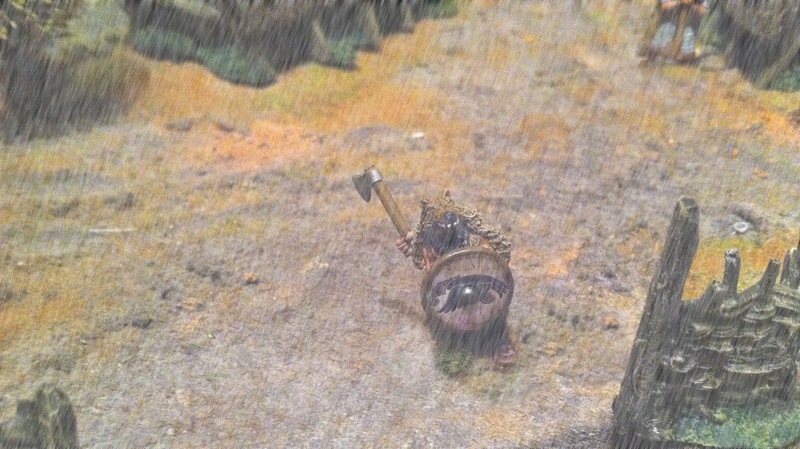 His two warhammers thirst for pagan blood. 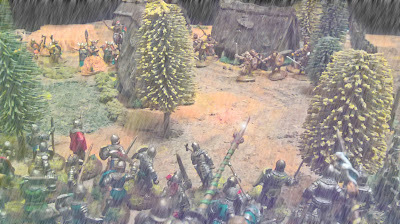 The French foot knights form the first wave of attack. 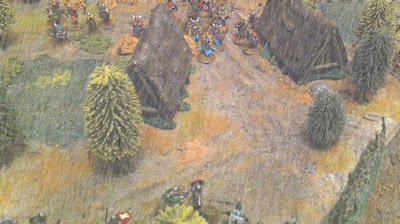 Cautiously, they enter the small town. The rain causes low visibility. 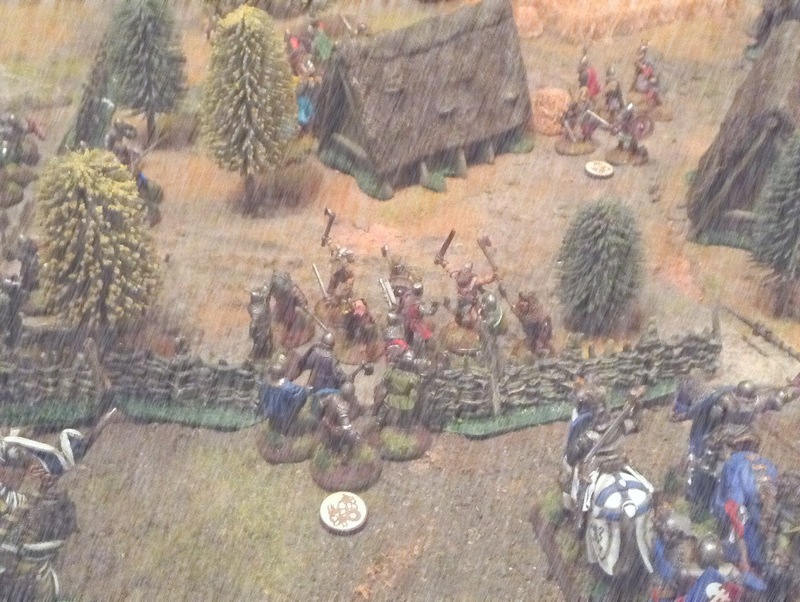 All of a sudden, dozens of shieldmaidens and Jomsvikings appear from their hidden positions. 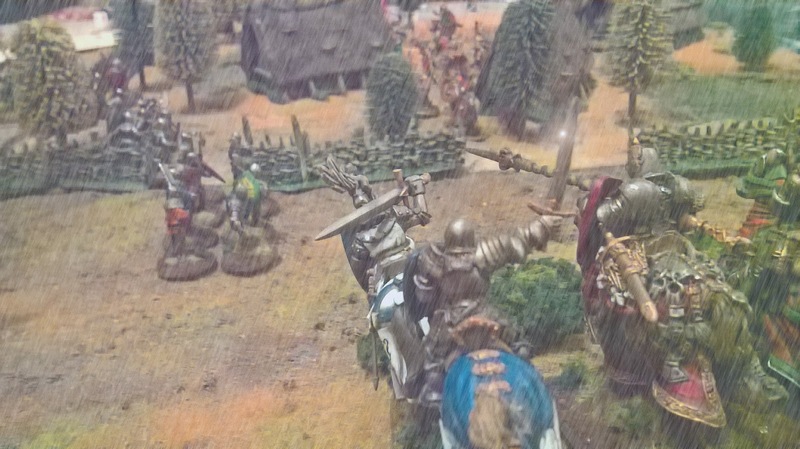 The foot knights brace for the impact of the Viking attack. Hand to hand combat erupts. 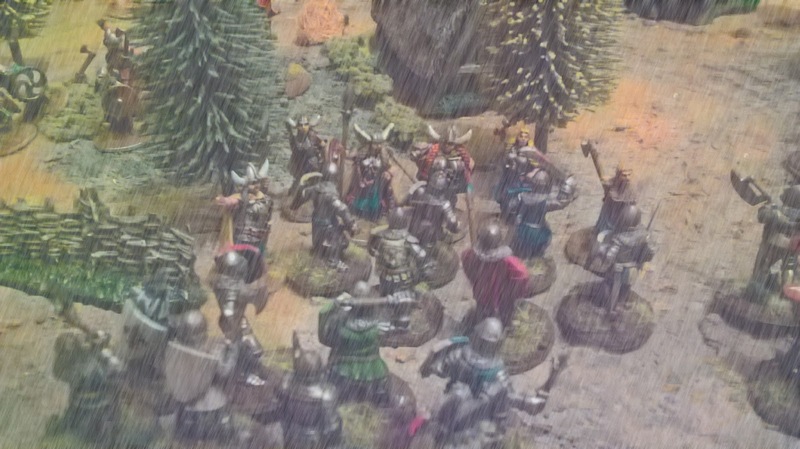 Knights and Vikings are cut down in equal numbers. 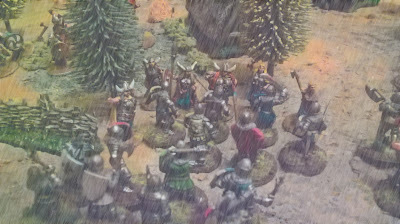 Helga directs another wave of Jomsvikings. Their numbers are few but they are a tough nut to crack! 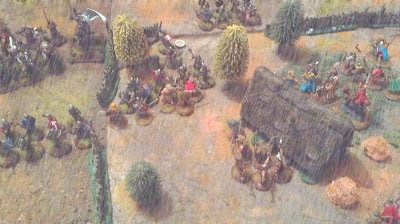 The ferocious Viking attack manages to push the knights out of the town. Casualies on both sides are horrendous. Roland decides to join battle. The muddy ground hampers the knights but they bravely push on. The countercharge manages to stabilise the French lines. 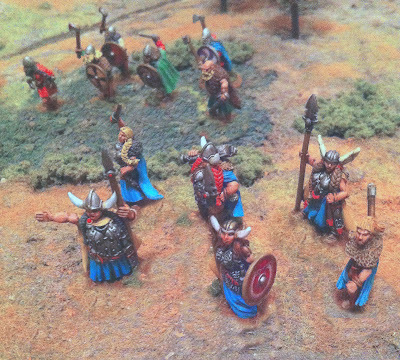 Not to be outdone, Helga also enters the combat. 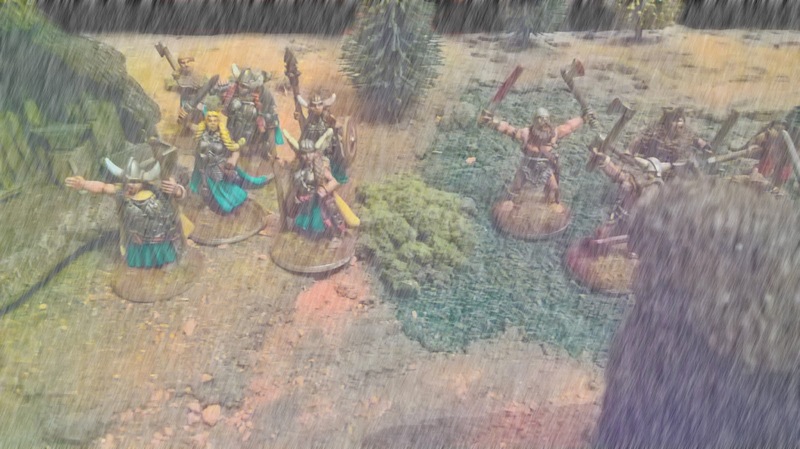 Her Valkyries cut down the knights by the dozens. 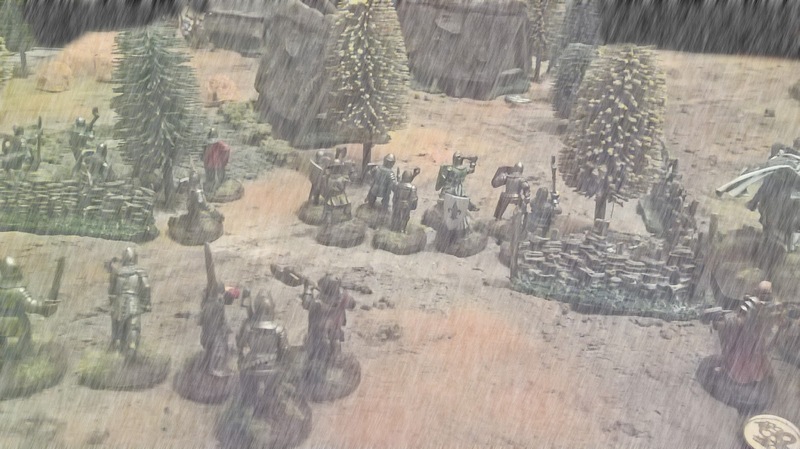 The French knights decide that enough is enough. No glory is to be won here, only death. Roland gives the signal to retreat from the town. 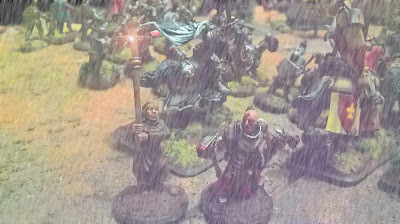 Hundreds of dead and wounded knights stay behind. The Vikings emerge as the victors. One warrior is not satisfied tough. Björn wanted to earn his place at Valhalla but he could not find a glorious death on the battlefield. ← Wargaming 4 Life – Bedankt voor jullie steun!